The “Nova Organi Harmonia” demanded from each of us an unusual commitment; we have dedicated to it the best of our energies. Would it be, therefore, presumptuous on our part to be satisfied with the result and to expect its welcome reception in the musical world? Dr. Ronda’s examples: I think I have a mild form of ADD where I have great trouble sitting still. I am always fidgeting with my chap-stick, writing down little reminders on post-its, etc. I decided to see what it would be like if whenever I was at prayer or Mass to take care of little needs beforehand. 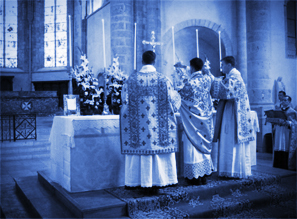 As a result I did experience greater recollection at Mass and Liturgy of the Hours and quiet prayer. Prayer: Mary, our great model for praying whole-heartedly, I can’t imagine you interrupting prayer to do little unnecessary things. I picture you with serenity doing many little things with love, but then in prayer focusing your whole mind, heart and soul on God. Would you be my mother in this area of my life?